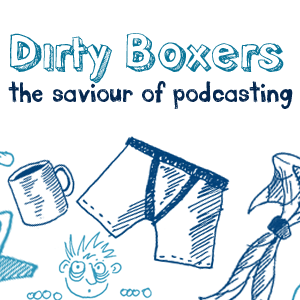 A special edition of Dirty Boxers. BIG thank you to Adam from music-av.co.uk for finding this recording. This was recorded at CamJam 2011 on Friday 5th August 2011. A special edition of Dirty Boxers. BIG thank you to Adam from music-av.co.uk for finding this recording.This was recorded at CamJam 2011 on Thursday 4th August 2011. On this rather odd show, we try and chat to Prawn Tom via Skype (yet all hell breaks loose! ), Livestream keeps crashing, Audio issues PLUS peeps in the chatroom keep changing their nicknames to cause even MORE confusion! Kung fu commuters let off steam, Shop worker bitten by scorpion, PLUS your geeky news. DB122 – Only bloody on time! It’s Friday… did you know? GET LEIGH ON RADIO 1 BREAKFAST SHOW! DB097 – Doing it LIVE baby!